In reality, Dante loved Beatrice from a distance and they had little to no contact with one another. 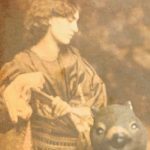 The real Beatrice Portinari probably never had any idea of the depth of his passion for her. Yet she was to become one of literature’s most famous figures. 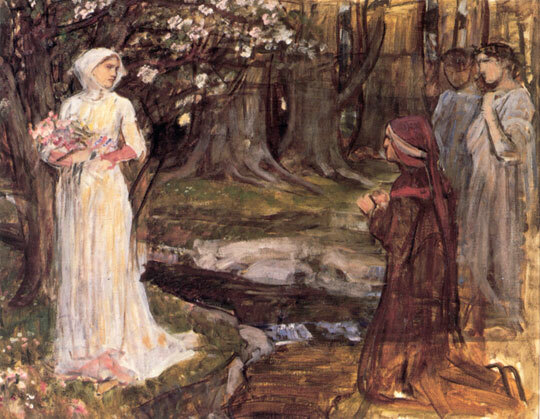 Dante Alighieri first saw and fell in love with Beatrice when he was nine years old. 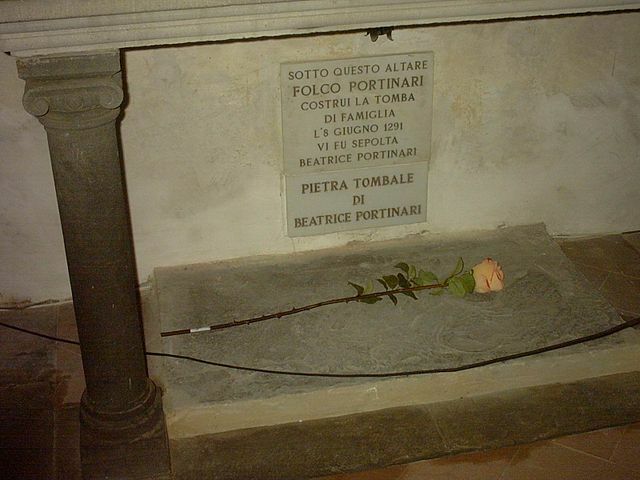 He would later write about his instant love for her in Vita Nuova, saying “Behold, a deity stronger than I; who coming, shall rule over me.” He loved her from afar for the rest of her life. She would die in 1290 at age twenty four. Beatrice is more than a simple muse. She is an idealized love, the kind of love that transcends physicality. Alighieri included her in both La Vita Nuova and Divine Comedy. She is his salvation; the “gentilissima” (most kind) and “benedetta” (blessed). It is Beatrice who serves as his guide in Heaven in Divine Comedy. 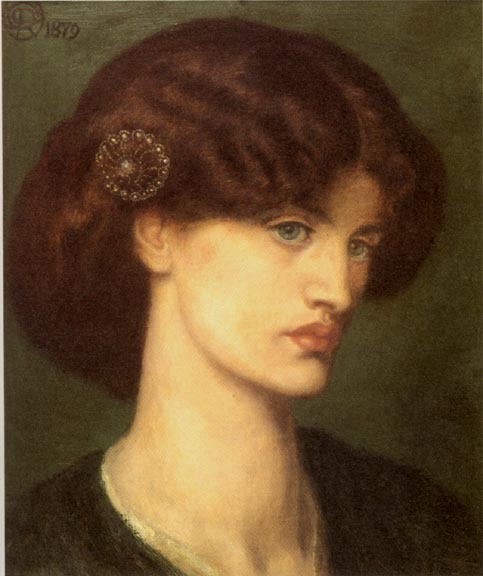 Any discussion of Pre-Raphaelite works of Dante and Beatrice is dominated by the paintings of Dante Gabriel Rossetti. 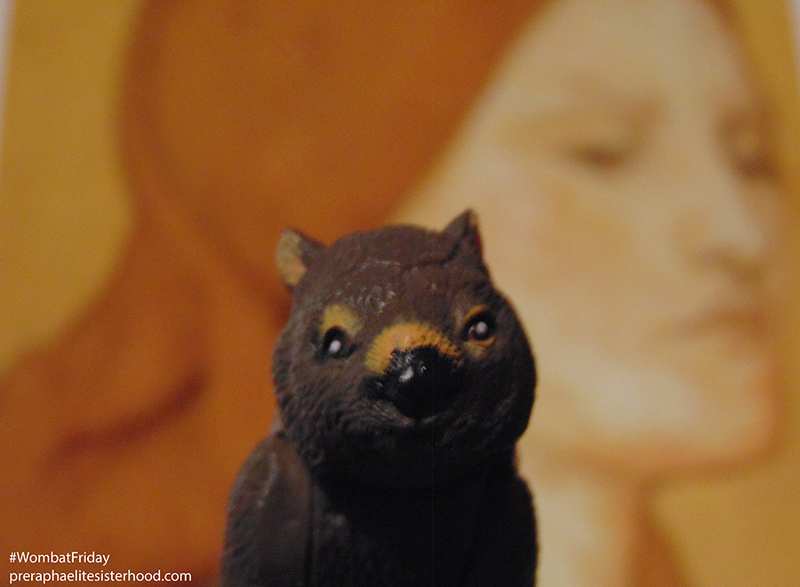 The influence of Dante Alighieri was Gabriel’s birthright; he was an inescapable ghost in the Rossetti home. 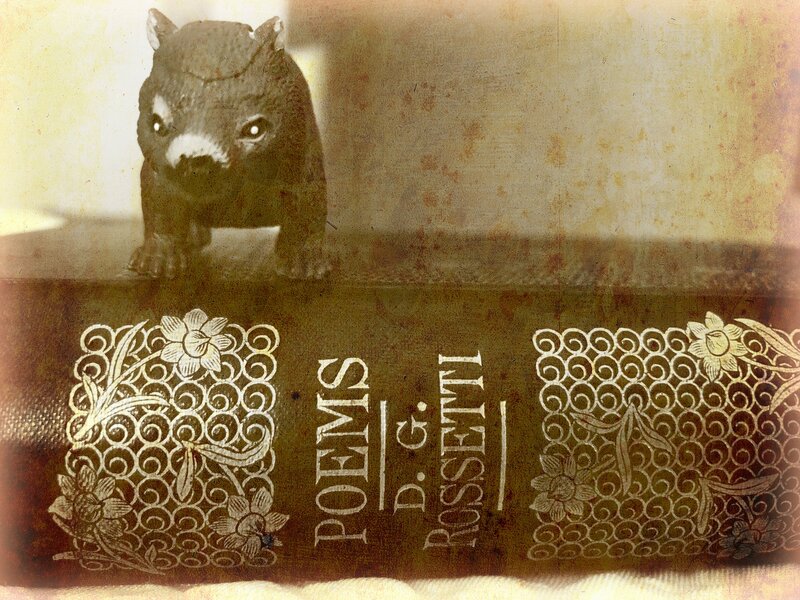 His father, Professor Gabriele Rossetti, was a Dantean scholar whose obsession for finding Masonic allusions in the works of Dante became his life’s fixation. 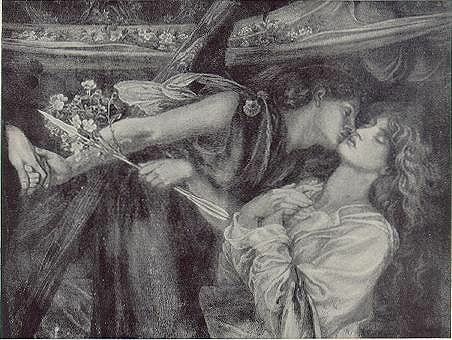 Although in his younger years, Dante Gabriel Rossetti preferred English writers such as Shakespeare and Sir Walter Scott, Dante Alighieri seems to have been absorbed into Gabriel’s DNA and became a frequent subject of his work. 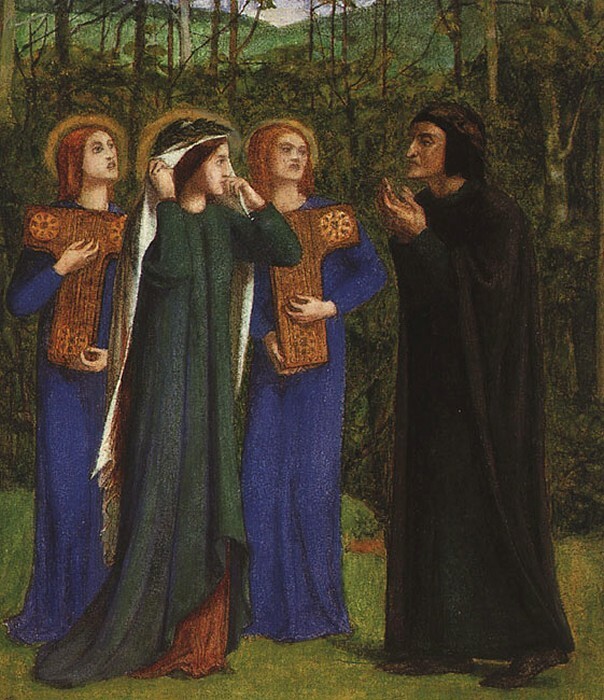 Gabriel would later translate Dante’s Vita Nuova and his own personal life and relationship with Elizabeth Siddal, the model/painter who would later become his wife, seemed at times to parallel Dante’s love for Beatrice. 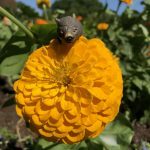 I began to feel a faintness and a throbbing at my left side, which soon took possession of my whole body. 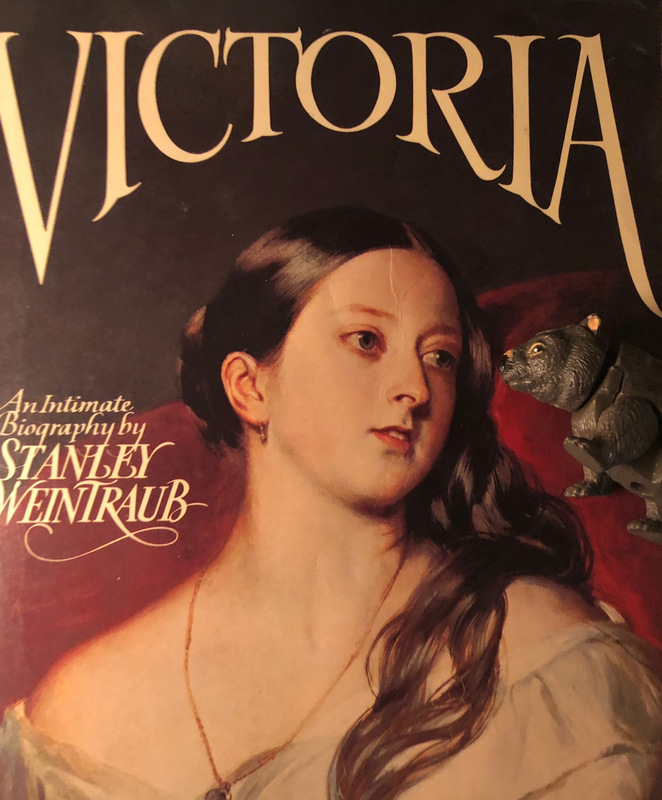 Whereupon I remember that I covertly leaned back unto a painting that ran round the walls of that house; and being fearful lest my trembling should be discerned of them, I lifted mine eyes to look upon those ladies, and then first perceived among them the excellent Beatrice. 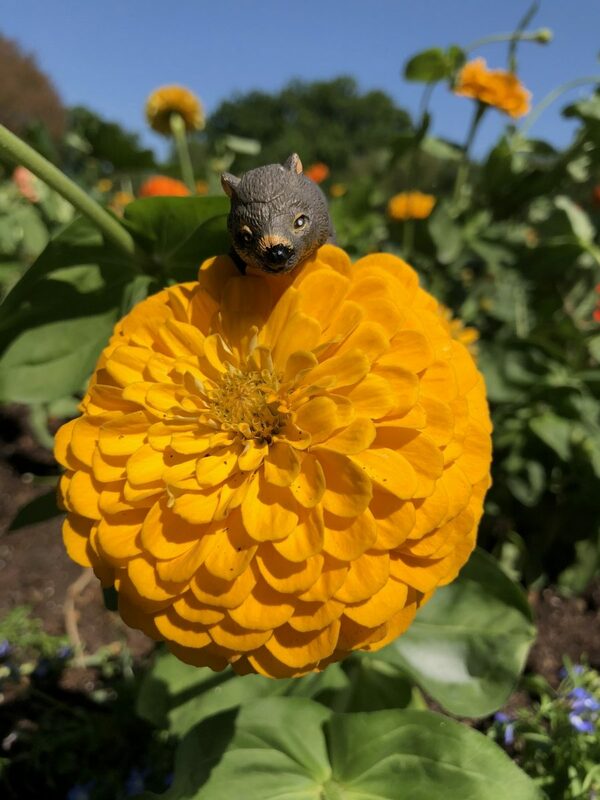 And when I perceived her, all my senses were overpowered by the great lordship that Love obtained, finding himself so near unto that most gracious being, until nothing but the spirits of sight remained to me. 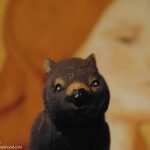 Elizabeth Siddal was discovered by artist Walter Deverell while she worked in a millinery shop. 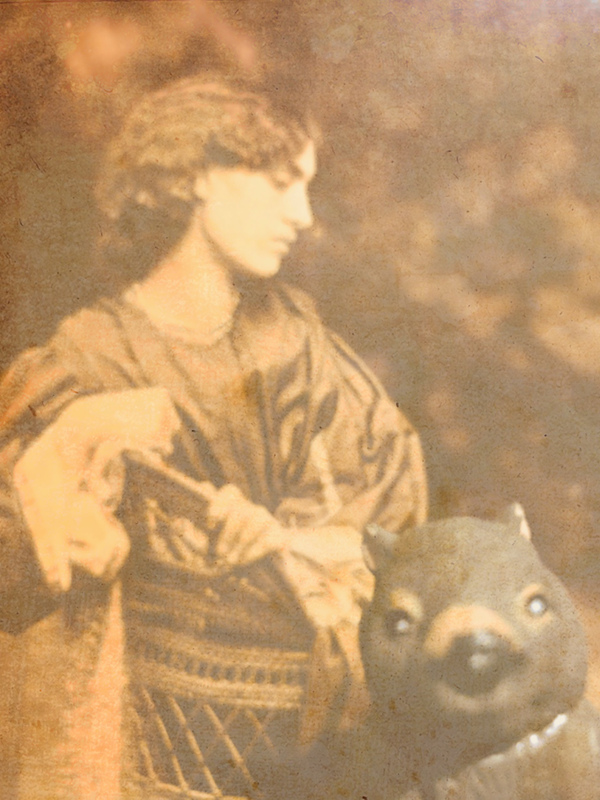 After posing for Deverell’s Twelfth Night, she began to model for other Pre-Raphaelite artists, including Rossetti. 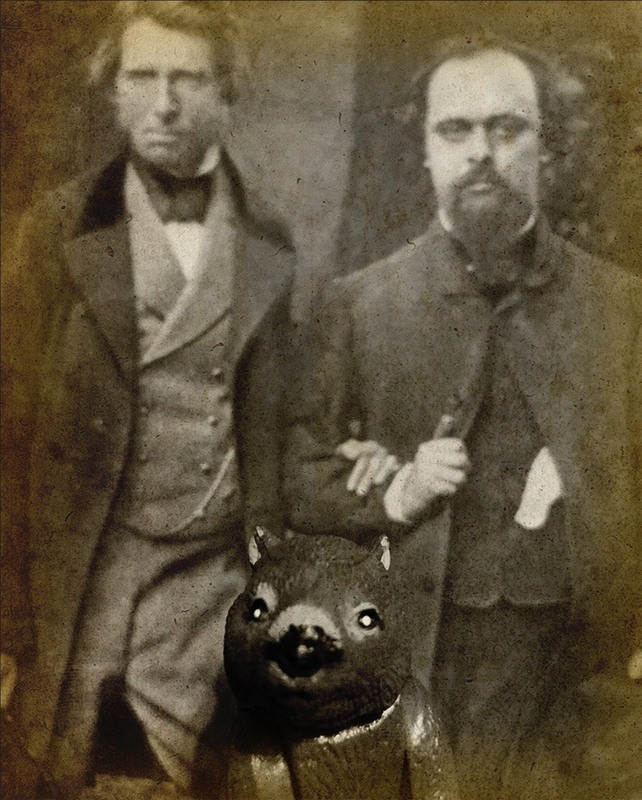 Upon learning that she also had artistic intentions, Rossetti took her on as a pupil and from then on, she posed only for him. This led to what would be an important yet complex relationship for both and they married ten years later. 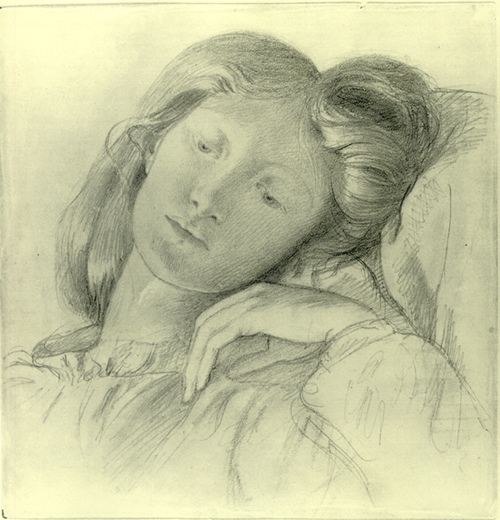 Rossetti confided to artist Ford Madox Brown that when he first saw Lizzie, he felt ‘his destiny was defined’. 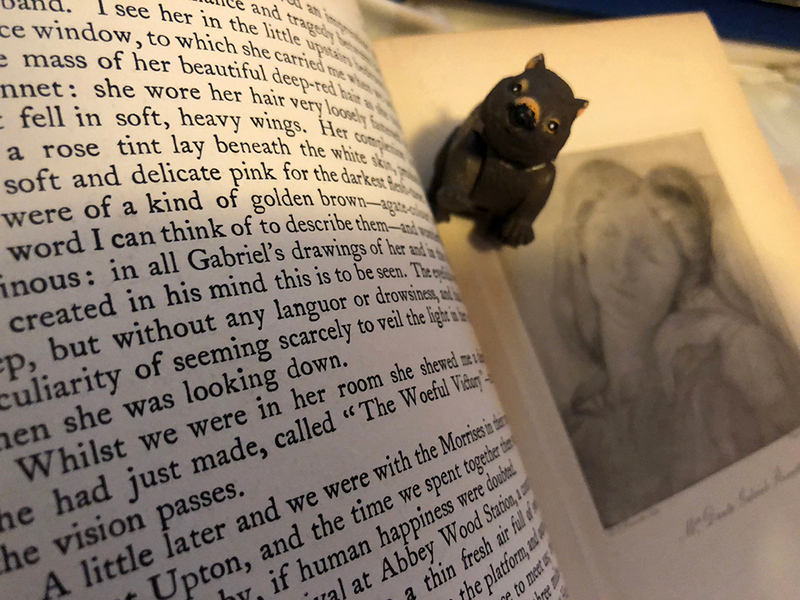 This sense of destiny may not have been the literal truth, but it illustrates his efforts to identify Lizzie with the type of love Dante had for Beatrice. 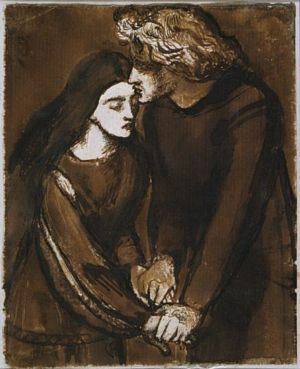 It may have been that Rossetti so identified with Dante that he mimicked his relationship with Beatrice, casting Lizzie as the ideal woman and declaring her to be his artistic muse. 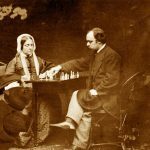 For more on their relationship, see my previous post Pre-Raphaelite Marriages: Dante Gabriel Rossetti and Elizabeth Siddal. 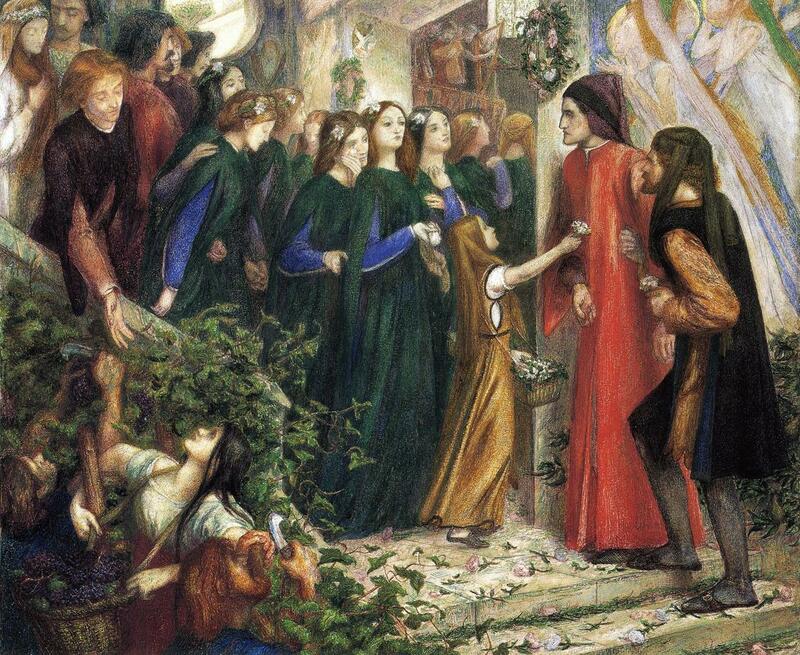 Siddal’s features can also be seen in The Meeting of Dante and Beatrice in Paradise. 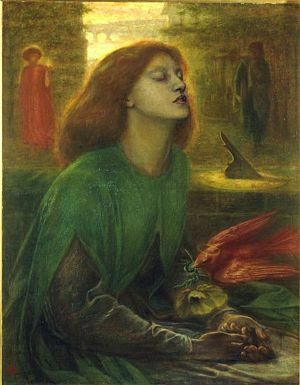 Rossetti was influenced by Dante’s Beatrice and Poe’s The Raven when he wroteThe Blessed Damozel. This idea of love after death would take on a deeper meaning after the untimely passing of Elizabeth Siddal from a Laudanum overdose. His identifying with Dante had reached a frightening new level. With his wife no longer a living muse she becomes an even more Beatrice-like figure, unreachable in the after-life. 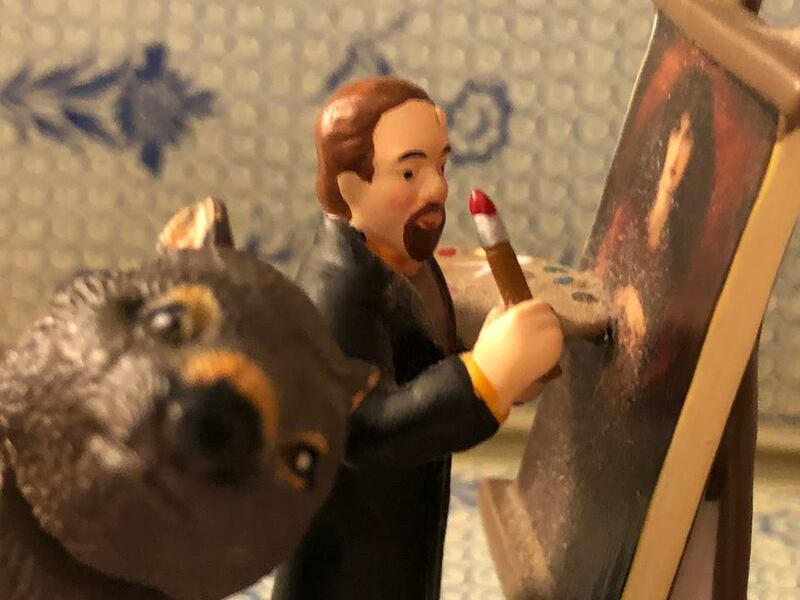 In his posthumous tribute to her, he painted her as Beatrice on the brink of death. In the background of Beata Beatrix, we see the figure of Dante and the allegorical figure of Love. 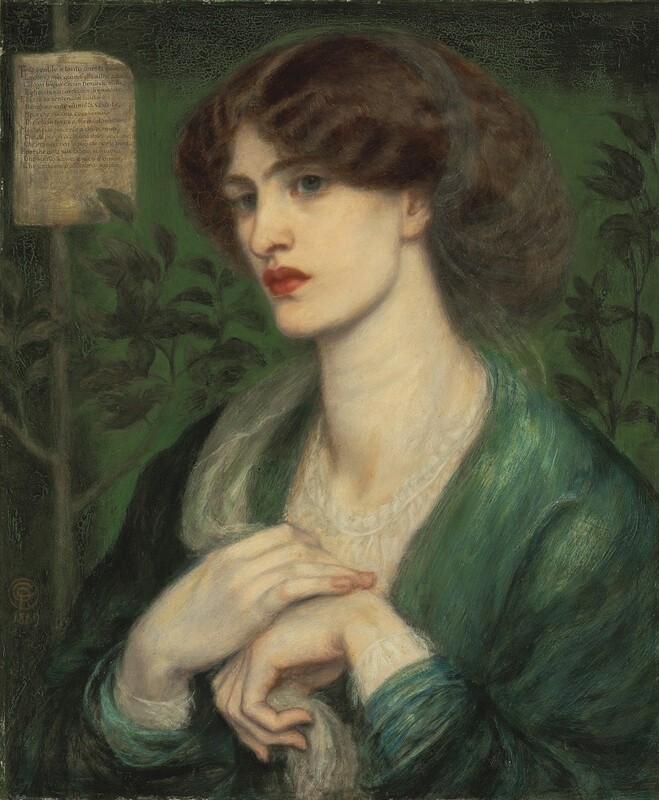 Rossetti painted Jane Morris as Beatrice in this uncharacteristically simple work. Devoid of his usual props, flowers, and symbolism, Rossetti casts Jane as the role once held by his wife. Note the spiral hair pin. Jane Morris appears again as Beatrice in The Salutation of Beatrice. 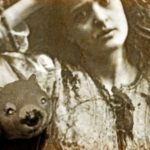 It seems that as much as Rossetti had always longed for the idealized love he had for Lizzie Siddal, he needed an earthly love as well. 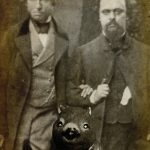 Siddal’s existence may have seemed to be a fulfillment of the love he wrote about in The Blessed Damozel, but it was not enough to sustain him. 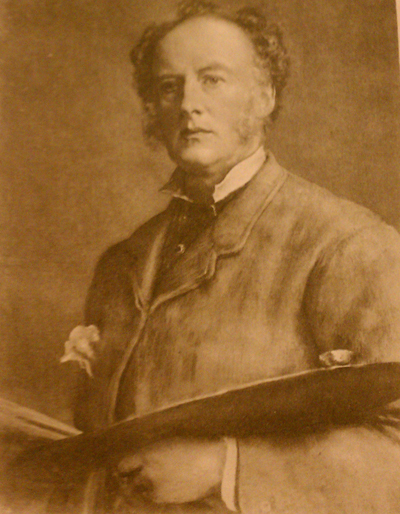 Throughout the course of his life, he had passions for other women, including model Fanny Cornforth, Siddal, and Jane Morris. Each of these loves had undeniable influence on his work and style. 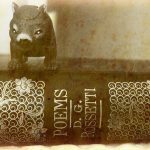 There are so many Rossetti works inspired by Dante that I certainly can not include them all here in this blog post. 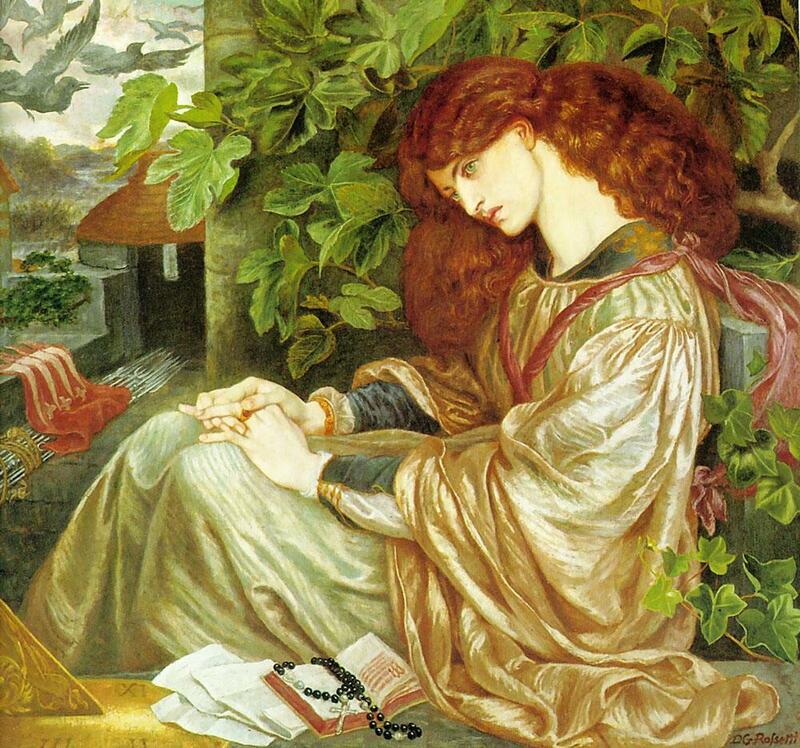 But I do have to share another of Rossetti’s paintings of Beatrice that I find to be quite beautiful. It has lighter tones and a delicate, floral motif. 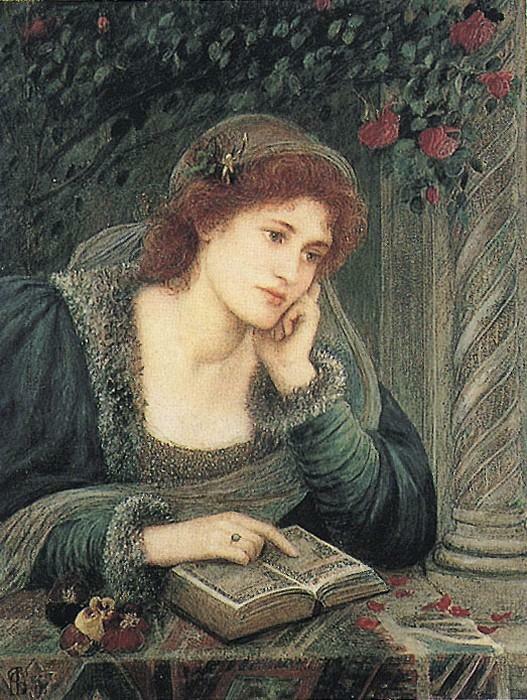 In short, this is the type of Rossetti I love. 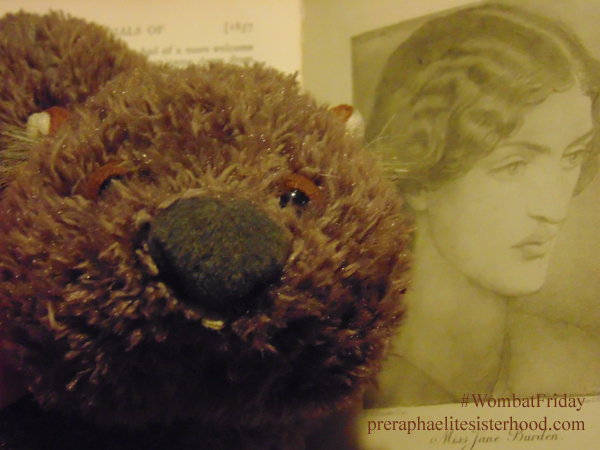 Jane Morris as a goddess-like figure as only Rossetti can capture her, similar to my other Rossetti loves: The Day-Dream, Proserpine, and Astarte Syriaca. 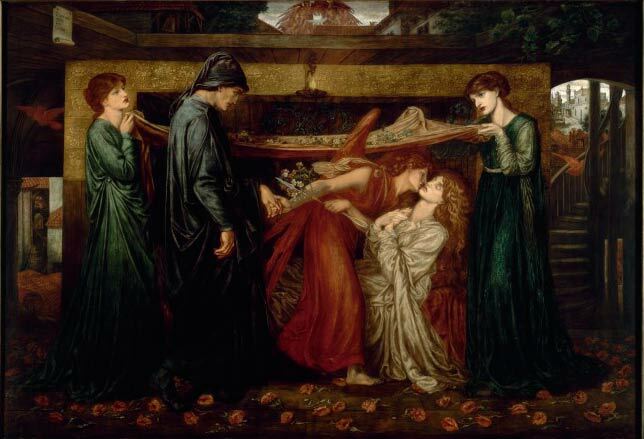 The largest of Rossetti’s Dantean works is Dante’s Dream, a representation of Dante dreaming of Beatrice’s death in Vita Nuova. Notice the poppies scattered on the floor. 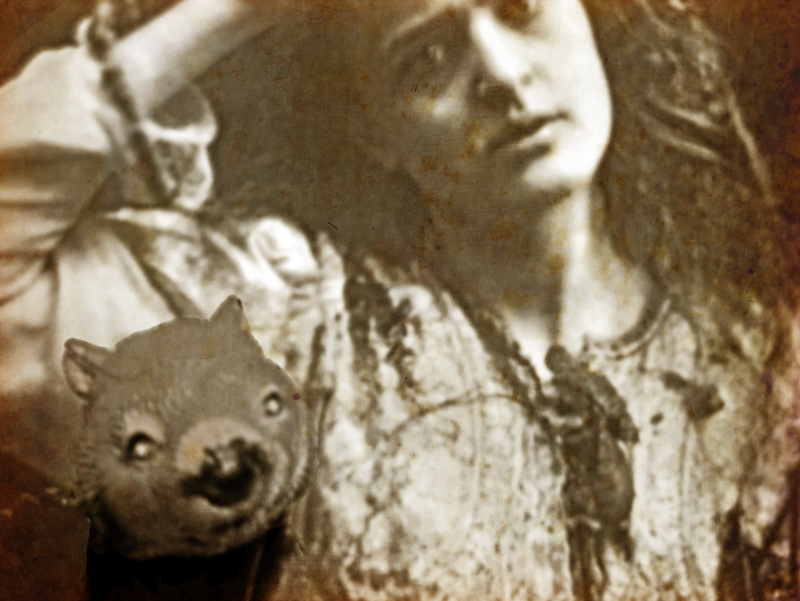 Jane Morris appears as Beatrice, although Rossetti has given her Elizabeth Siddal’s red hair. 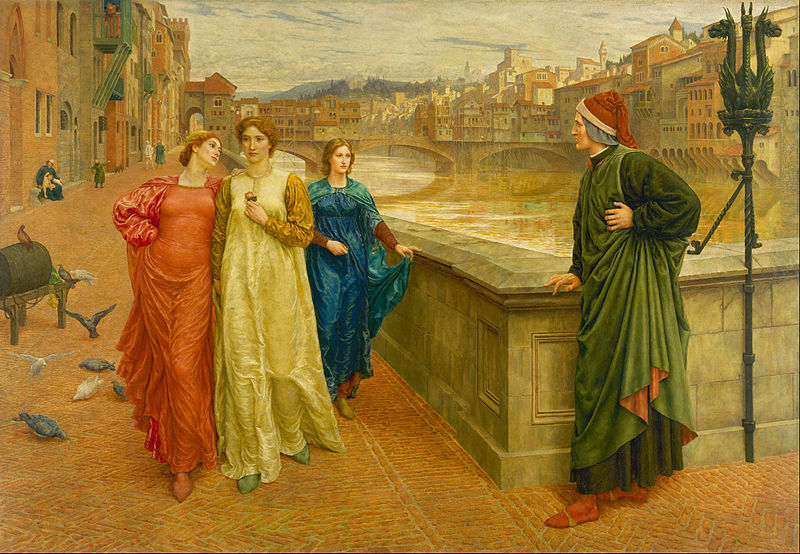 Other Pre-Raphaelite and Victorian artists created works inspired by Dante’s unrequited love for Beatrice. 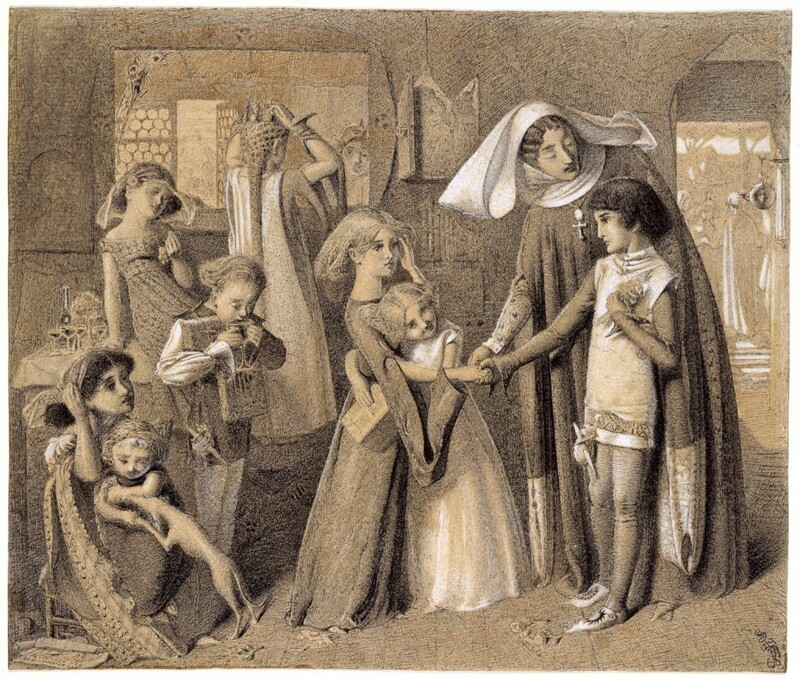 Simeon Solomon was definitely influenced by Pre-Raphaelitism, and Rossetti’s influence can be seen in his drawing of Dante meeting Beatrice. 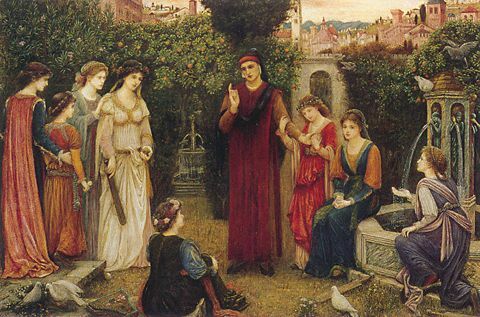 Henry Holiday, who on his death was described as “the last Pre-Raphaelite” painted Dante and Beatrice in 1883-4. 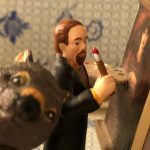 He traveled to Florence in order to achieve accuracy in his work and I have to say that I find the architecture impressive. 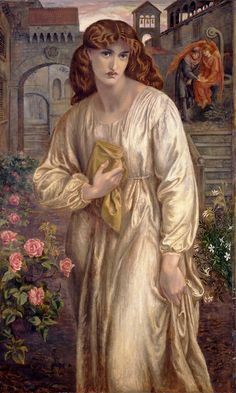 Marie Spartali Stillman studied under Ford Madox Brown and in 1867, she became a friend of Dante Gabriel Rossetti as well. 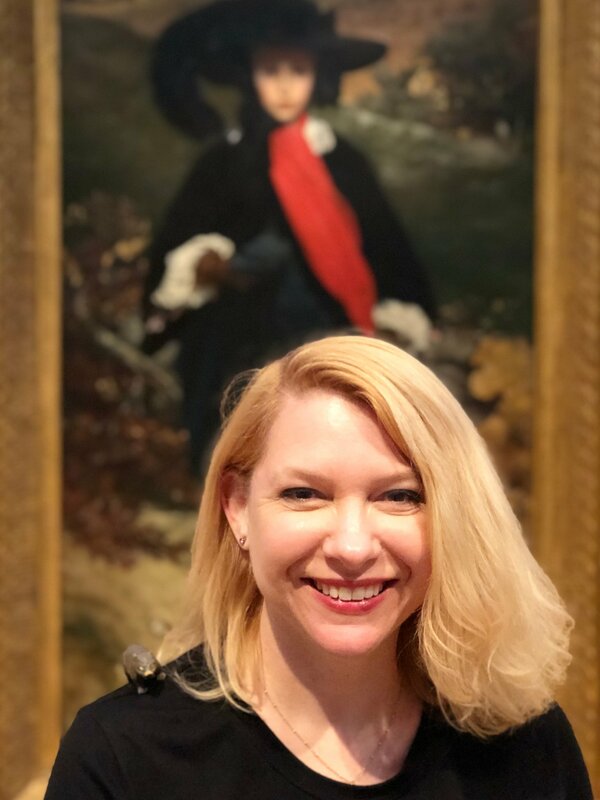 That friendship helped inspire her paintings of Dante. 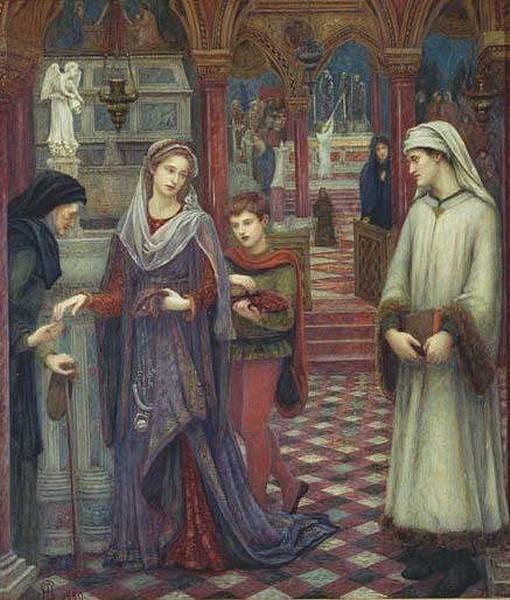 In the late 1870s, Spartali Stillman moved to Florence and living there influenced many Italianate works, some of which were inspired by not only classical sources, but Dante Gabriel Rossetti’s Early Italian Poets. 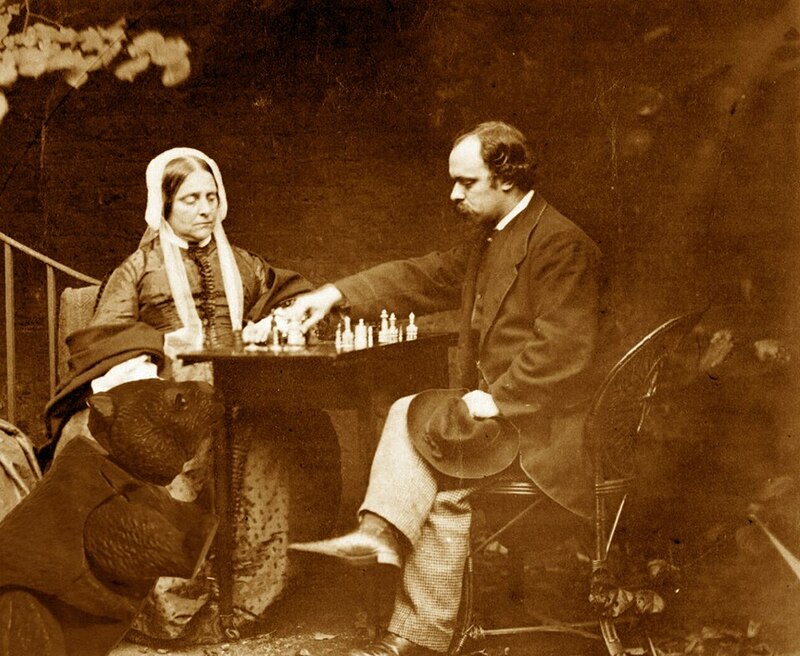 It is easy to forget that Beatrice was a real woman. Of course, we know nothing at all about her apart from Dante’s obsession with her. What were her passions, her fears, her loves? 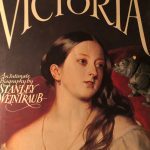 She may have died at twenty-four, but she has achieved literary immortality.What can we in the 21st Century learn from Dante and Beatrice? The fact is, our society seems to have forgotten that there are many forms of love. 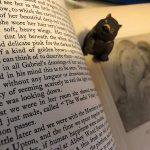 Dante’s love for Beatrice may have been idealized and unattainable, but at the core of that love is admiration, goodness, and respect. That’s a type of love that you don’t see much of in the media of today’s world. We prize the scintillating and love has become synonymous with physical lust. Dante’s love transcends the physical. It is a love of the heart and the intellect. Treasuring the people in your life that inspire us intellectually, prompting us to be the best version of ourselves that we can be? That’s something for us all to aspire to. Thank you for such an interesting and beautifully written piece. I wanted to just add that I initiated the rose on the tomb tradition which has blossomed into the letter writing, I did it in August 2004. Its beautiful to see it the tradition grow and grow! 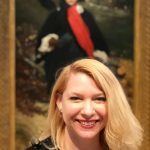 Such an interesting piece! Thanks.